Reach Out and Read Kansas City has been named sub-recipient in a $3.8 million Innovative Approaches to Literacy grant awarded to the Children’s Reading Foundation by the U.S. Department of Education. For 2014-2015, we will receive $22,590 to pilot two new early literacy and early learning programs to serve high-poverty communities in the Greater Kansas City area. “We are honored to have the opportunity to build upon the solid foundation of our existing clinic-based school readiness program by presenting early learning and literacy skills workshops directly to local families,” said Mark Mattison, Executive Director of Reach Out and Read Kansas City. 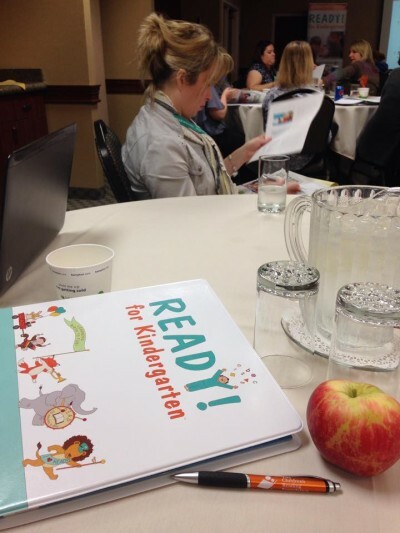 “Following the Greater Kansas City Chamber of Commerce’s decision to add Kindergarten Readiness to its Big 5 Goals, this grant provides the perfect opportunity for us to do our part by expanding our current role.” Per the terms of the grant, we will be introducing in Kansas City the READY! For Kindergarten and Read Up programs, both developed by the Children’s Reading Foundation and currently operating successfully in chapter sites throughout the U.S. and Canada. READY! For Kindergarten classes provide training and tools for parents and caregivers, equipping them to help children birth to age five develop strong brain connections, ensuring school success. Studies show nearly 80 percent of children whose parents take part in READY! meet the kindergarten reading readiness standard regardless of family income or ethnicity, compared to 55 percent of children whose parents do not attend. The Read Up program is a summer literacy program that helps keep reading a part of daily summer routines by providing free books and weekly story times for children birth to eight. The program aims to reverse the “summer slide,” a situation where students lose up to three months of reading skills when school is out. Through this program, Reach Out and Read Kansas City will receive and distribute more than 13,000 books. The nonprofit National Children’s Reading Foundation is headquartered in Kennewick, Wash. The organization was founded in 1996 with the vision that every child learns to read early and well, thereby reaching his or her full potential in school and life. The reading foundation developed and delivers national programs focused on reading skills and school readiness for children birth to age five. The organization also helps establish local Children’s Reading Foundation chapters in communities across the country. Learn more at: www.readingfoundation.org. Read the Children’s Reading Foundation’s press release.